The Marianopolis Music program is a two-year, pre-university program that allows you to continue mastering your craft and performing, plus you receive the professional training that will help you get the university experience and the professional career of your dreams. At Marianopolis you can also choose one of three Double DEC programs that allow students to graduate with a DEC in Music and a DEC in Science, Social Science or Arts, Literature and Communication in three years and keep their options open. WHY CHOOSE MUSIC AT MARIANOPOLIS? Thanks to a unique partnership of over half a century between Marianopolis and the Schulich School of Music of McGill University, you benefit from personal instruction by Marianopolis and McGill Music professors in Classical or Jazz streams. You also get the opportunity to play in the McGill choir, orchestra and jazz ensembles. Only at Marianopolis can you study at McGill as a college student. Another reason to choose Music at Marianopolis is the size of our program. As a Music student at Marianopolis you are part of an intimate and supportive group of a few dozen students. You also get individualized attention from the professional musicians who are your teachers and coaches and whose main goal is to prepare you for a career in various music-related fields, from performance and recording to management, composition and more. And you are at a college that supports music in every way and gives you many opportunities to perform in formal and informal settings. We provide transportation to and from your McGill Schulich ensembles and courses and our campus. As a Music or Music Double DEC student you can audition for either the Jazz or the Classical stream. Whatever you choose, at Marianopolis you study Ear Training, Theory, Music Literature and Music Technology and you also participate in sight-reading labs and small ensembles. 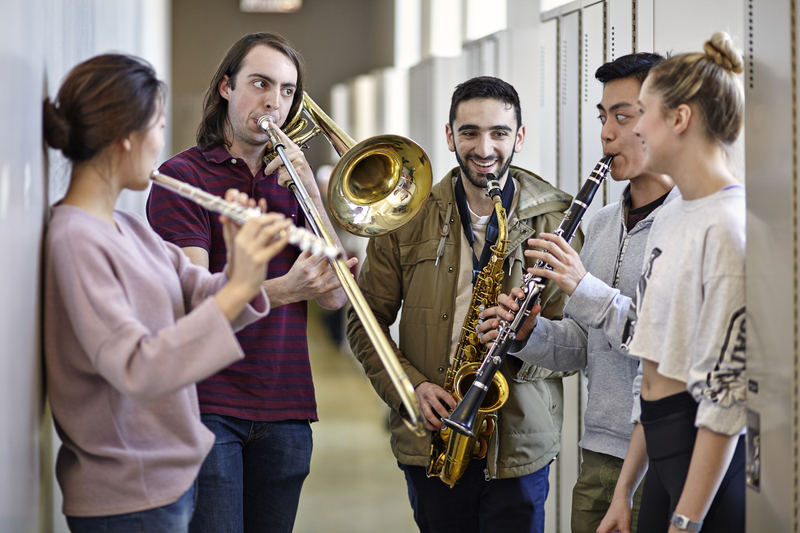 At McGill you take private lessons with Schulich professors and have the opportunity to audition for the university’s highly regarded orchestra, choirs, wind symphony and other ensembles. Another wonderful thing about Marianopolis is our wide range of opportunities to practice your main instrument of study. 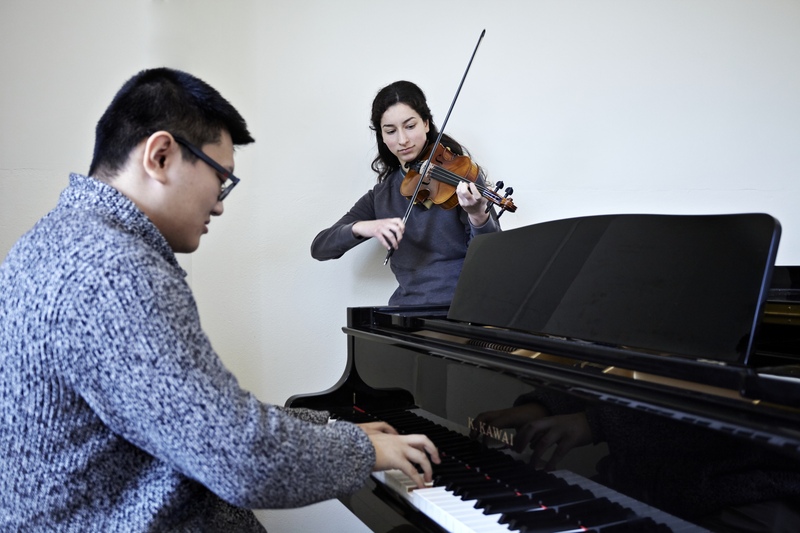 For classical musicians, a weekly one-hour lab, held in small groups separated by instrument family, complements a weekly hour of private instruction. This lab builds your sight-reading skills and deepens your knowledge of your primary instrument. You also have regular practice with or as an accompanist. Instead of labs, jazz students participate in jazz combos and take the Jazz Materials class, where they learn about jazz theory and improvisation. You also have access to professional-quality recording facilities, including our integrated recording studio/music technology classroom and portable recording rig for use in our Auditorium and elsewhere. We have the latest Pro Tools and Digidesign software for mixing and editing audio, as well as Auralia for ear training and Finale for score writing and editing. Our recording facilities are fully digital and include top-notch equipment from Mackie, Furman, Klein+Hummel, Whirlwind, DBX, Neumann, AKG and Sennheiser. Our Music Technology course covers important topics beyond sound recording; it includes sampling theory, sound synthesis, MIDI, acoustics and more. Whether you are interested in creative mixing, making in-studio audition demos or recording live recitals, Marianopolis has the tools you need. WHAT CAN I DO WITH A DEC IN MUSIC? Marianopolis has a two-stage audition process. The first stage is a pre-audition at the College. There is no application fee and no obligation to apply to Marianopolis after your pre-audition. The pre-audition gives us a chance to meet you and to evaluate your level to see if we think you are ready to proceed to the audition at the Schulich School of Music of McGill University, which is the second part of the audition process. The pre-audition gives you a chance to see Marianopolis and to tell us about your background and training in performance, theory and ear training. Pre-auditions last 20 minutes and take place weekdays after school hours. You can sign up for a pre-audition here. The requirements for the auditions at McGill are below. The second stage of the audition process, the formal audition at McGill, determines whether you are accepted into the Music Program. After you successfully complete your pre-audition we schedule your audition at McGill. They last 15 minutes and usually take place around the third week of March, typically on the weekend. Occasionally they take place weekdays. Classical instrumentalists and singers must provide their own accompanists. Jazz performers may bring supporting musicians or a backing track. When you successfully complete both auditions you are scheduled to take placement tests in Theory, Ear Training and Sight-Singing. The tests are held at the College in mid-March, usually on a Saturday morning. You must receive a grade of 70% in order to pass. We don’t exclude you from the Music Program if you don’t get this grade. We re-test you in August to ensure that you meet the program requirements. In order to pass the tests, you should have the equivalent of McGill Conservatory Secondary V, RCM Grade 2 Rudiments or Vincent d’Indy 6e année. You must take the placement tests even if you have completed any of these levels independently. You must get a mark of 70% on the theory test in order to be accepted without qualification. If you get less than that on any part of the test we have you re-take the test or parts of the test in August. Any traditional Jazz instrument such as saxophone, guitar, bass, piano, clarinet, etc.